The car company doesn't consider itself a car company. Ken Washington, vice president of research and advanced engineering for Ford, at the company's CES booth. Car companies won't survive without innovating their business offerings. Ford knows this, which is why the more-than-a-century-old company considers itself a "mobility company." At this year's CES, Ford showed off three of its latest innovations: drivers can now talk to their vehicles' SYNC hands-free system with Amazon Alexa integration, an autonomous Focus vehicle and one of its vehicles for Chariot, its ride-sharing service. 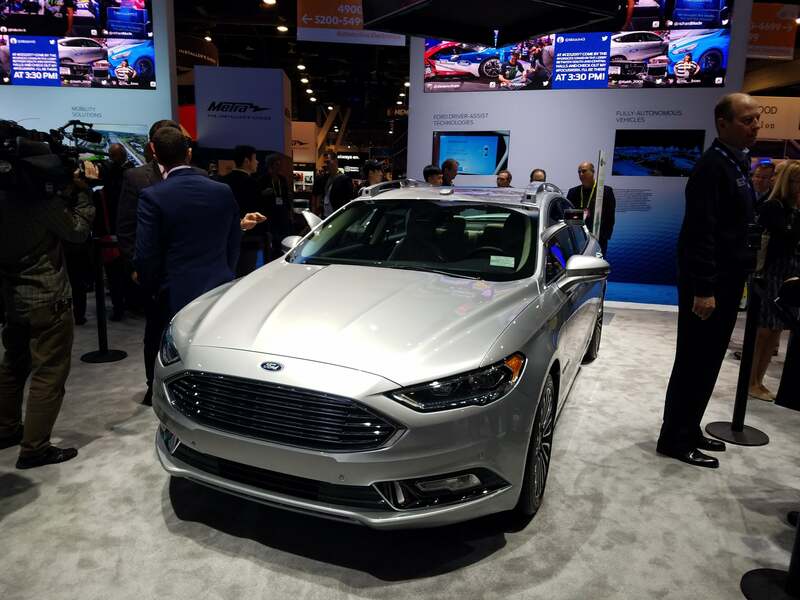 To get a sense of what these developments mean for the brand, and how Ford looks for and integrates ideas, I spoke with Ken Washington, Ford's vice president of research and advanced engineering at the company's CES booth. Why is Ford at CES? We think of Ford as a mobility company and the vehicle as just a big consumer electronics device. By being here at CES, it's a way to advance our perspectives and learn and convey our point of views about technology's importance in enabling new ways of being mobile and enabling the car to be an even better consumer electronics device. What you're saying is that the thinking is not really a shift, it's kind of Ford fulfilling its mission. Exactly. A car has shifted from a relatively dumb device to being connected, smart and autonomous. And as a connected, smart and autonomous device that's fairly sophisticated with millions of lines of code and dozens of computing modules, it's only going to get more sophisticated with the ushering in of connectivity and autonomy to enable cars to do even more for us. We're very excited what the possibilities. Ford announced last year that it launched a ride-sharing initiative with autonomous vehicles and plans to get them on the road by 2021. That seems ambitious, but we're on our way there with Uber and other companies having similar initiatives. We're really excited about that. What better way to make people's lives better than enabling them to have a high-quality, safe ride service that will allow them to get time back but also have this ability to move from one point to another at a very attractive price point? So with this initiative, Ford opens its business to people who don't want to own cars. You've seen that shift already happening because you have driver-driven ride services that are now pretty common. But the business model for those is questionable. It's still relatively expensive to hail a Lyft or an Uber and even more expensive to use a taxi service. If you can take the driver out of the loop, it lowers the cost point to be competitive to personal vehicle ownership. That doesn't mean personal ownership will go away, because you'll still have the option to buy a vehicle. But having this option of not driving if you're in an environment where there is a ride service is very compelling and exciting. An autonomous prototype of a Ford Focus. Ford also has a presence at Eureka Park (CES's space for startups) and with the 2021 initiative the company partnered with four startups. What does Ford look for in younger companies to invest in and partner with and what can companies do to make themselves more appealing to Ford? We're pretty expansive when we're looking at the startup community, because we see many great ideas coming out of startups. Part of the formula for being successful in partnering with Ford is on our shoulders. It's for us to be in the environment where the startups are and for us to be proactively engaged and participating with the startup community. So we interact with startups and get to know them, learn what they're working on. We invite them to present their ideas for how they'd like to work with Ford and if we can find common ground and interest. Sometimes that leads us to develop a proof of concept where we try their technology out. That would be the best way for startups to interact with Ford -- for them to talk to us and help us get to know what their ideas are. We can then help you understand how your idea might integrate with the automotive and mobility ecosystem. The idea looks to be the most important factor to Ford. The idea is always powerful. Keeping an open mind as well. We've had lots of startups come to us and say, "here's our idea, it's A." [But creators should] know A can become B can become C. Keep an open mind about how your idea might pivot. That's sort of startup 101, which is your original idea might not be the idea that gains traction and leads you to a market. Keep an open mind, work with us and explore the possibilities. That's a great formula for an entrepreneur to explore working with Ford as we continue on our journey to be a mobility company and a lead in autonomy. What has been the most helpful piece of advice in your professional life that you'd want to share with other people? For me, it's about staying curious. If you want to work in a technology rich business, keeping a curious mindset is really important. That will serve you so well in so many different ways. It helps keep you out of a rut, and it helps you avoid missing inflections and transitions. When you see something new, being curious allows you to dig in and ask questions and explore technology proof of concepts. A good way to end is to reinforce that we are really excited about how we can help make people's lives better. This isn't just about technology for technology's sake. This is about ushering in an era of transportation mobility. If people can't drive because they are disabled or blind or maybe just don't want to because they're tired, and by the way, autonomous vehicles and new services open up the promise of reducing traffic accidents. This is about safety, making people's lives better and opening up new business opportunities for our shareholders. I love technology, but I love it even more when it can make a difference in people's lives. His answers have been edited for length and clarity.